If you love ginger or ginger vodka, this is going to be one of your favorite new cocktails. The Ginger Sour is a fantastic and very easy drink to make and it has a fun contrast of flavors that should impress anyone. The Sour Ginger was created by Adam Wilson of Beretta in San Francisco. It was designed to feature Skyy Vodka's ginger-infused vodka, which was one of the best ginger vodkas I have had to date. The vodka has since been discontinued and your best option is to make your own. The instructions for the infusion are below. This is a simple cocktail that shows off the vodka's flavor wonderfully. It is one of those drinks that displays a new liquor in an old-school drink style and that is what is so great about it. The ginger, maple, and lemon are excellent together, creating a sweet, zingy spice offset by a fresh sour. There is a lot going on in the drink and when it all comes together it is an amazing experience. Garnish with the twist of lemon. Beyond the vodka, everything else in this cocktail is fresh and it would only make sense for the lemon juice to follow suit. The average lemon yields about 1 3/4 ounce, so one lemon be plenty and you may even get enough for two drinks out of a larger lemon. If you are careful and want to conserve your lemon, cut the twist first then cut the lemon in half to get the juice needed. If you do not have maple syrup on hand, a rich simple syrup or dark agave nectar will do fine, though they are not quite the same as a truly rich maple here. The average large egg has an egg white of about 1 ounce. Since this recipe calls for 1/2 ounce, you will either want to split the egg white in half or make two drinks at one time. There is a point where this cocktail can have too much egg, so it is important to be aware of that. How Strong Is the Ginger Sour? 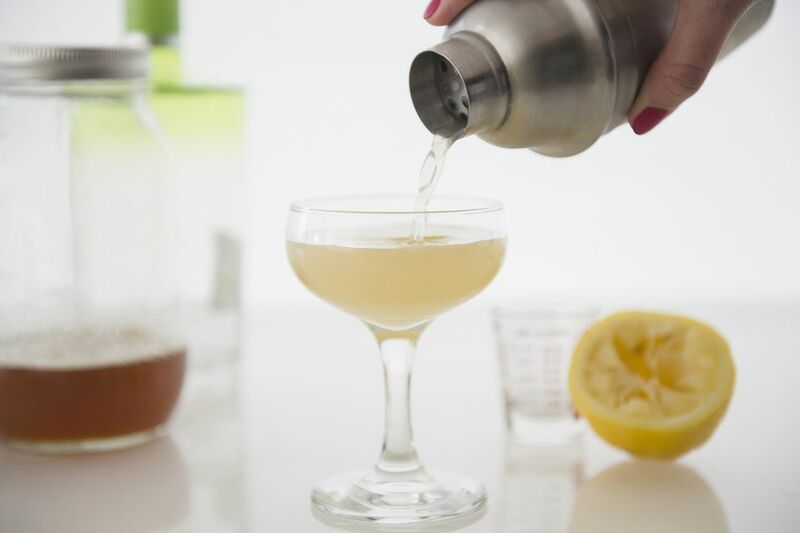 This Ginger Sour recipe is surprisingly light compared to many other vodka martinis. That is because Skyy Ginger is a 70 proof vodka and it is outweighed by the total volume of everything else in the drink. Enjoy the smooth sipping of this drink because it comes in at right around 15 percent ABV (30 proof). Ginger is a great flavor for distilled spirits and it is very easy to make your own ginger-infused vodka. This infusion can take up to two full weeks to reach the optimal flavor, so it is best to plan ahead. *Some ginger infusion recipes will call for grated or diced ginger. I prefer slices because they are easier to strain out after two weeks in the liquor. Of course, if you are using an old liquor bottle these may not fit the narrow neck, so feel free to dice them to size. Add the cut ginger to an infusion bottle with a tight sealing lid. Shake well and store in a cool, dark place. Give the bottle a good shake every day or so. After 7 days, test the vodka for flavor and continue infusing for 2-3 days longer if needed. Test again and go longer if you want a stronger flavor. Once the flavor has reached its peak, strain out all of the ginger pieces and re-bottle the vodka under a tight seal. Label and date the bottle. You do not have to use your best vodka for this infusion, but I also do not recommend being a total cheapskate. Choose a good vodka that you would not mind drinking in a cocktail as transparent as this Ginger Sour.